More than 50 all-age groups will compete as part of the Drum Corps Associates World Championships starting today, Friday Sept. 4 through Sunday, Sept. 6. in Rochester, N.Y. The DCA World Championships is the culminating series of events for the organization's competitive season which is made up of more than 20 events in the East and Midwest from late June through the end of August. 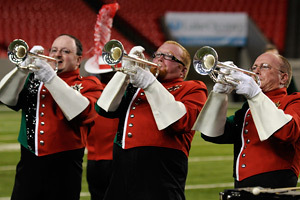 Each summer a handful of DCA groups participate in select events on the Drum Corps International Tour, and each year many DCA performers come from the ranks of DCI corps. 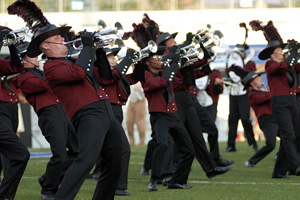 Current Vigilantes drum major Brittney Summers is an alum of the Bluecoats and the Cadets, having served as the Cadets' drum major in 2008. Summers said it wasn't her plan to jump straight into marching as a member of an all-age corps after her DCI age-out year, but that she was convinced to join by her friend, the corps' brass caption head. "We've got 15-year olds with 55-year olds standing next to each other," Richmond explained about the all-age corps experience. "It's really awesome to see the generations working together, and that's really what it's about. For us, it's about getting together on the weekends and having some fun putting together a show." The Vigilantes will compete this weekend in Rochester starting with the DCA Class A Prelims on Saturday. The Alumni Spectacular (9 corps, tickets $18) 10 a.m. – Marina Auto Stadium Open Class & Class A Championship Finals (15 corps, tickets starting at $32) 5:30 p.m. – Marina Auto Stadium Learn more about all events DCAcorps.org.